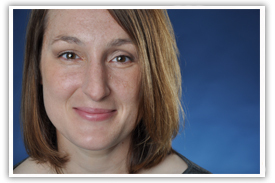 “I don’t exactly remember, but I think the conversation with my parents went something like, ‘Mom, Dad, I want to leave my full-time ride academic scholarship at a private women’s university to attend a school you’ve never heard of in a state you’ve never visited to pursue something I’m not very good at,’” said Dr. Karoline Pershell, assistant professor in the Department of Mathematics and Statistics. Pershell recently spoke to the University of Tennessee at Martin Development Committee about her less than normal path to attending UT Martin and the life lessons she learned during her time as an undergraduate. It was all for bull riding. “I decided I needed to get some professional help for my bull riding addiction, and UTM had a fantastic rodeo program, so I decided to transfer down here,” Pershell said. Pershell grew up training and showing horses in summers, and while attending the University of Notre Dame’s all-women’s part, Saint Mary’s College, she heard of a rodeo club starting in the area. Though she had no rodeo knowledge, she joined thinking with her background with horses, she would ride saddle broncs. There was a practice pen about an hour away, she explained, but upon arriving she discovered that it only provided bulls. “… so I said, ‘I knew that.’ So never having planned to get on a bull in my life, I was getting on five minutes later,” Pershell said. 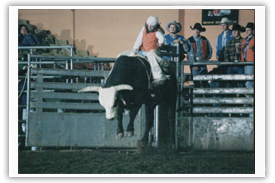 That was the start of her love for bull riding that would lead her to UT Martin’s rodeo program. Pershell vowed to be the hardest worker on the rodeo team, which was the first lesson she took away from her time at UT Martin – there’s no substitute for hard work. Finally, it was a lack of fear of failure that contributed to Pershell’s success. Because she was unafraid to chase a passion, she was rewarded with a lack of regrets. She ended up graduating from UT Martin in 2003 and received her master’s degree from Rice University in 2006 and finally her doctorate from Rice in 2009, she then returned to UT Martin to teach. Pershell said she returned to UT Martin because of the support she has and still receives here, and she was recently accepted as a Fulbright Scholar, which will allow her to teach mathematics in India next year. “I believe that the work ethic I developed while pursuing dreams that just didn’t mesh with my natural athletic ability has been central to my success in other areas of my life. I hope that rodeo continues to be that source of inspiration for many future students for them to become the best that they can be as well,” Pershell said.